A few fixes, and improvements to this excellent application. 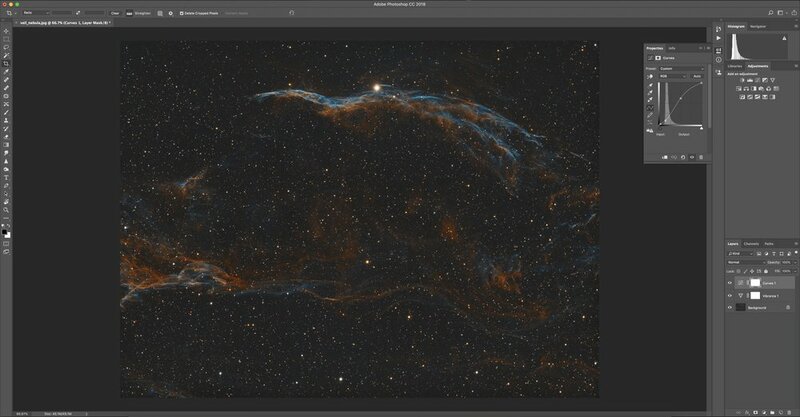 The final result of processing the Veil Nebula in Astro Pixel Processor on the Mac. To get started, you'll need to have taken a full set of light images to process. In addition you will need darks, flats, and bias for calibration of those light images. The calibration process is going to remove any artifacts caused by dead pixels in your camera, and correct for lens dust and uneven illumination caused by your image train. Starizona has a great page detailing why you would do image calibration. If you don't have Astro Pixel Processor, you can download an unlimited 30-day trial at the website. If you like the process, and find the program easy to use, it's fairly affordable in comparison to some of the other tools out there. When you first open the program, you'll be asked to choose a working directory. I typically make a folder on my desktop called Processing, and put all my images neatly organized into folders within. I label them Light, Darks, Bias, and Flats. Inside each folder there are more folders for each filter. 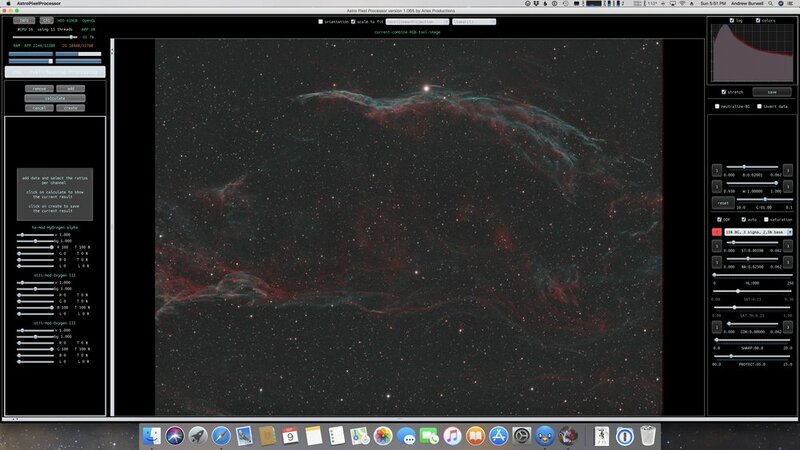 For this particular image, I have HA and OIII images of the Veil Nebula, so there is a folder for each in the light folder, and a folder for each in the Flats folder. Bias and Dark can be shot as a single set (the filter doesn't matter since the frames are dark) and used to calibrate both HA and OIII. From here, I need to go to the Load tab on the left panel in APP. I'm going to check off a setting here for Multi-channel/filter processing since I'm processing two channels/filters at once. You do both at once here, because you want them to register the alignment of all stars across all images at the same time. If I had shot the same filters over multiple nights, I could select Multi-Session processing, which allows you to do day 1, 2, 3, 4, etc. of each filter and use a different set of flats for each day of the same filter. This is especially useful if you re-image an object over multiple nights throughout a year, you can keep adding data to improve your image. But in this case, I shot all my images for each filter on a single night. NOTE: If you have a One Shot Color (OSC) camera, and need to make some modifications to the images as they are processed, you would go to the RAW/FITS tab and you can select debayer options there before you load your lights in. On the load tab, you will now select the Light button, navigate to your first lights folder and select your first set of images for the first filter. In this case, I'm selecting my HA images. You can select the first image in the list, scroll to the last, hold shift, and select it. This will multi-select all images in the window, and you can then press OPEN to import them. When you add them, it will ask you which filter these light images are, be sure to select the correct filter. In this case they are Hydrogen Alpha images. I select that, then you'll see that there are a bunch of images now associated with the Light button on the left pane. Press the light button again to add the second filter's images. This time go to your OIII light directory and select all OIII frames. Open them, and choose Oxygen III for the filter. Now your light frames are loaded. You'll do the same for flats, being careful to assign HA flats to HA filter and OIII flats to the OIII filter. This insures the right frames get calibrated with the right flats. Now add your Darks and Bias frames. For both of these when it asks which filter to choose, pick the top options to apply the Darks and Bias to all filters. Now, we're going to set one calibration option, and that's to have the program create a bad pixel map. You'll press tab two "Calibration", scroll down and find the check box "Create Bad Pixel Map". This will create a map of all bad pixels on your camera sensor, and correct for them when processing the final image. This is a very straight forward simple process just to give you an idea of how the program works. We're only going to set a few things in this tab. We're going to integrate per channel under the Multi-Channel/Filter options setting since we're processing multiple filters of light data. We're also going to stack all 100% of the images, because I've already gone through them and removed any images where clouds or airplanes came into the frame. You could lower the % to integrate if you want the program to automatically remove the worst images based on a percent of overall images. I'm going to also set "weights" to quality. This is going to look at all the images in my set, and integrate lower quality images with a lower weight than higher quality images. I'm going to set "Outlier rejection" to "Windsor clip" and leave the rest of the settings to the default. This is going to average out satellites and other stray objects that get into the frames. Finally, we now have all settings ready to go. It's time to start the integration process. You'll press the integration button, and now APP will run through your entire set of images creating master bias, dark, flats, and bad pixel map. It will then apply them to all your light frames to calibrate them, then it will align all frames using the registration process, and finally integrate them into two light images, one for HA, and one for OIII. These image thumbnails were generated with a finder plugin that came with Observatory on the Mac. From here, we're going to load integrated light frames in order to process them into a final image. 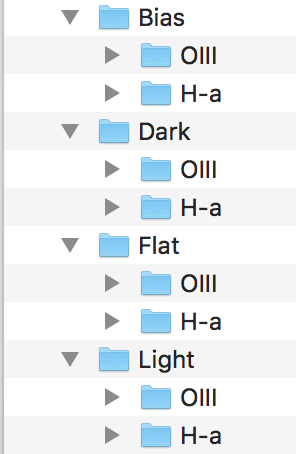 If you look at the bottom of your files window in APP, the last two files on there should be your Integrated HA and OIII images. The first thing we're going to do is remove any light pollution that came from either the moon or any nearby lights (or city glow). 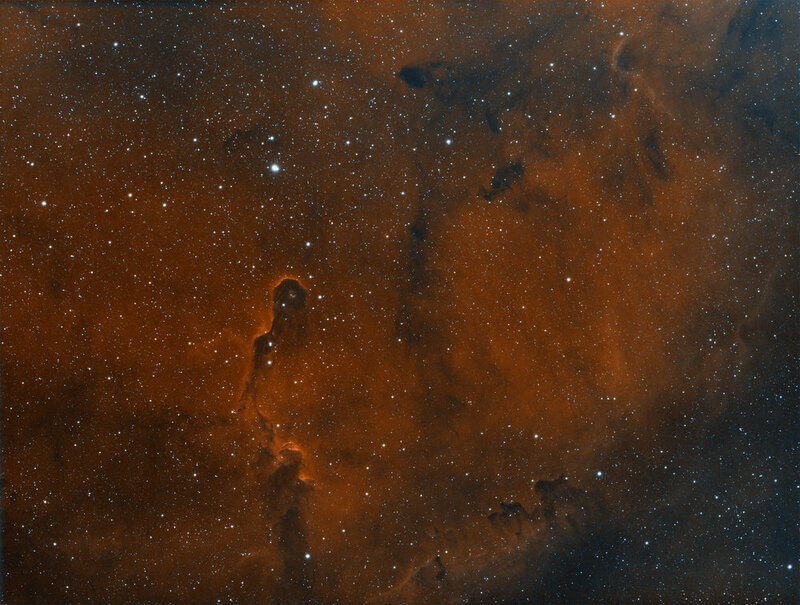 Even narrowband images can be affected by light pollution, but it will not be quite as bad as RGB images. Open the tools tab (Tab 9), and double click the first integration image, this loads the image into the viewer, and you can now press remove light pollution on the tools tab to open it for editing. With your image loaded into the light pollution removal tool, you'll take your cursor and draw boxes over any area that is sky only. Be careful not to draw boxes over any area that has nebulosity or image data in them. It's OK if you include stars. Once you have a good set of boxes covering most of the area, press the Calculate button. This will remove the light pollution based on the boxes you have currently. Once you see how this has an effect on your screen, it might reveal some hidden nebulosity that was covered by the light pollution. You should now be able to add a few more boxes to finish refining the light pollution removal. Once complete you can check by pressing calculate again. If you're happy with the results, press OK & Save. Rename your file here to remember which version this file is. Each time you process an image with APP it will have you save that image. You can continue to save over the previous image, but I always find it best to rename it different after each save. I use HA-LPR in this case. Keep the format as FITS. Now you can process your other channel the same way. Don't worry about the edges of your frame. Due to the different alignment of each frame (assuming you used dithering curing your image capturing) you will have a few pixels on each side of your frame from the registration process. It's not necessary to try and remove any light pollution from here as you'll just crop it out in the next step. Cropping your frames is a little tricky. You can load them one at a time using the batch modify tool and manually draw a box around each one. But that's imprecise. You might accidentally crop each frame differently. In order to do both at the same time with the same crop, you'll need to NOT load an image before choosing "batch modify". So press Batch Modify, tell it not to load an image, and it will then ask you which files you want to batch modify. Select your two frames that have light pollution removed. 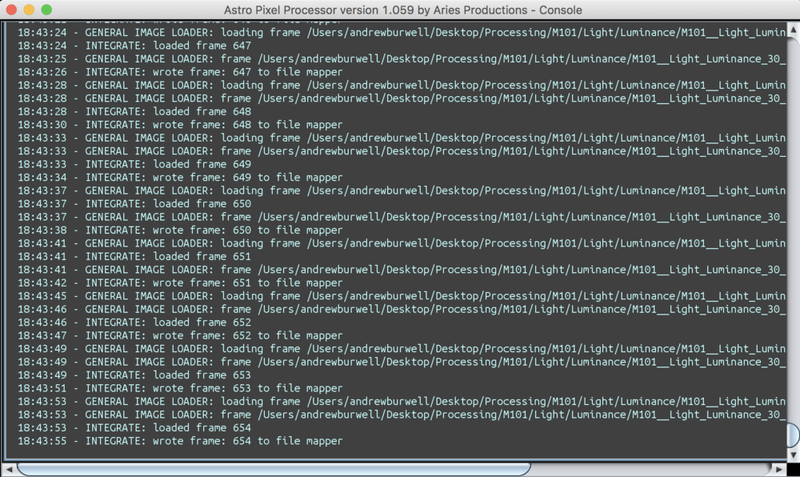 It will load the first frame. Draw a box around it, and press the Crop OK button. This will crop both frames at this location you've indicated. You'll now see two frames at the bottom of your list that are both cropped. This is the fun part of the process. We're now going to take your two individual frames and combine them into a single color image. Now you'll choose Combine RGB in the tools area of APP (left Tab 9). It will open a new area with nothing in it. From here we're going to add in our images using the Add button. We'll pick the cropped HA image, choose HA channel. Then we'll pick OIII and choose OIII channel. Then, since a full color image actually consists of three channels Reg, Green and Blue, we need to add the OIII frame again. On the left column, you should now have 3 channels listed, each with a few settings underneath them. From here, we can assign which color we want each frame to be colored. 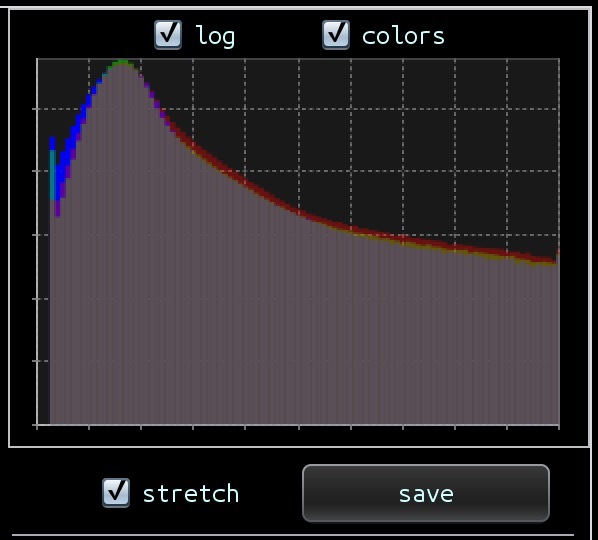 Take the slider under Hydrogen Alpha labeled R (for red), and slide it to 100%. Then make one of the OIII channels B (for blue) 100%, and the last channel of OIII G (for green) 100%. Now press the calculate button at the top of the column. This will process the three channels into an RGB image, and you should see the results in your main window. Now press the create button, save it as your RGB integration (any name you choose), and keep the format as FITS. We're now going to use the background calibration tool on our new RGB image. This is going to make sure that the black in the background is a true neutral color. If we had just a little bit too much red, or blue, this will knock it out and make sure the black background is true black. Load your image using the Background Calibration tool (tab 9). Draw your boxes around only background area that is black sky and stars. Do not get any of your nebulosity in the boxes, because we don't want it to neutralize your pretty colors. Press calculate to see the results. If it looks good press OK & Save. Name your file and pick FITS again for the format. 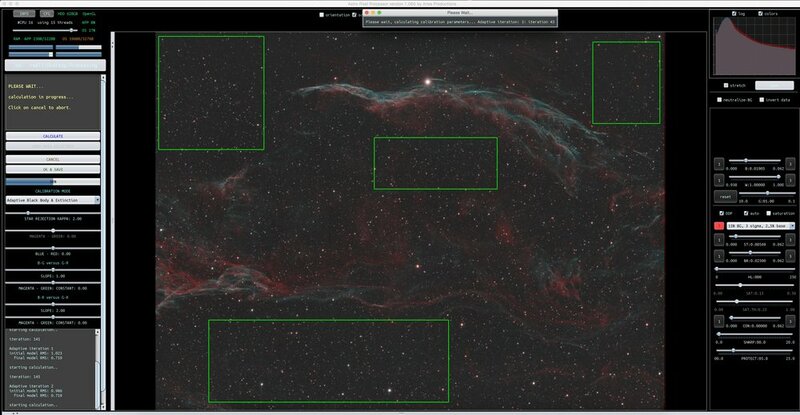 Because we're making a false color image with two filters, our star colors are going to be exaggerated a bit. I like to use the star calibration to bring them more in line with the typical star color temperature they should be. The calibrate stars tool is is also in the tools menu (tab 9). Select the image where you calibrated the background. Load it into the calibrate stars tool. And draw your boxes around large sets of stars. Press the calculate button, and this will process the image. You'll notice your bright red stars drop down to a more normal color. The stars are now in a proper temperature color range. 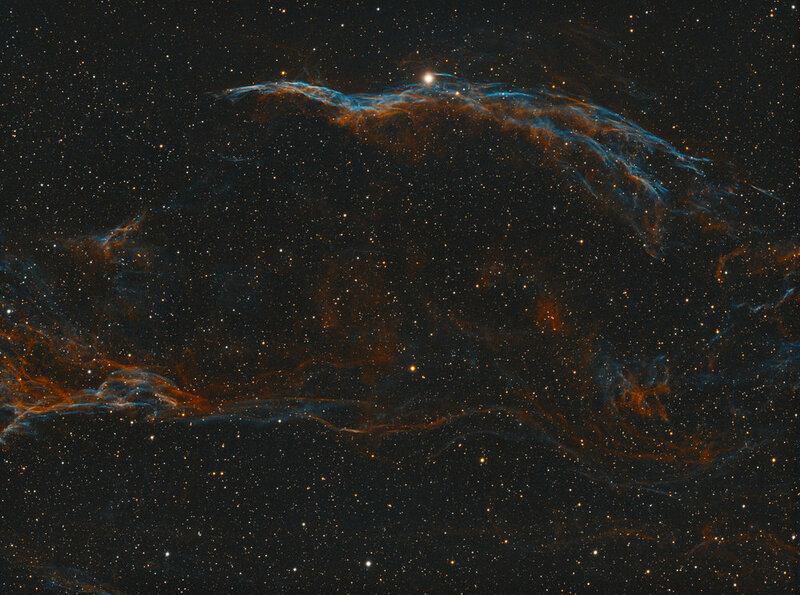 But you'll notice that we also lost a little color in the nebulosity. We're going to bring that color back in the next step. Save your image, and again name it and pick FITS for the format. In this last step, I'm going to process the final color in another app that I'm more familiar with. These steps can be done in APP using the tools always shown to the right of the image. But for me, I can achieve the results faster by using an app I know better. In this case, I'm going to use Photoshop, but the same tools I'll use here are also available in a number of other apps on the Mac. GIMP, which is free has these tools, as well as Acorn, Pixelmator, and others. First things first. We need to get the last image we did out of APP and into a regular image format for use an a standard image editor. In the upper right hand corner of APP, you'll see a Save button. Load your last star color calibrated frame, and then press the save button. Keep the stretch option checked, and it will export the image as you see it in the viewer. If you uncheck this, and export, you'll have to stretch your image in your other image app instead. I find the default stretch here to be adequate. When saving, make sure to pick a format you can read in your image application. I picked 8-bit Tiff, but you can also pick JPG if you want a smaller file at the expense of a little bit of quality. I now load the image into photoshop and apply some Curves to darken the blacks, and brighten the lights. I also add some saturation here to make the colors more vibrant. With those two things done, I'm ready to save my final image and complete the process. 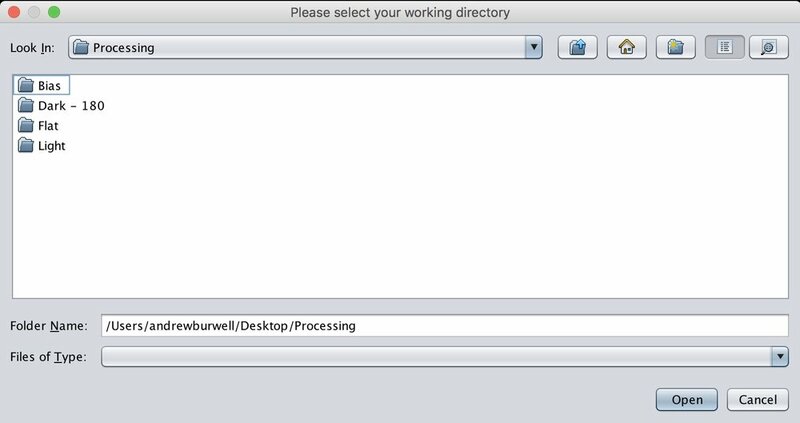 This tutorial is provided to show the basic steps in processing with APP. It is capable of so much more, and I only touched the surface with this tutorial. To achieve the best results, experiment with all the tools to see what you can achieve. I imaged this nebula over two nights for a total of 14 hours. There are 7 hours of H-a, and 7 hours of OIII data. Each done on a separate night. 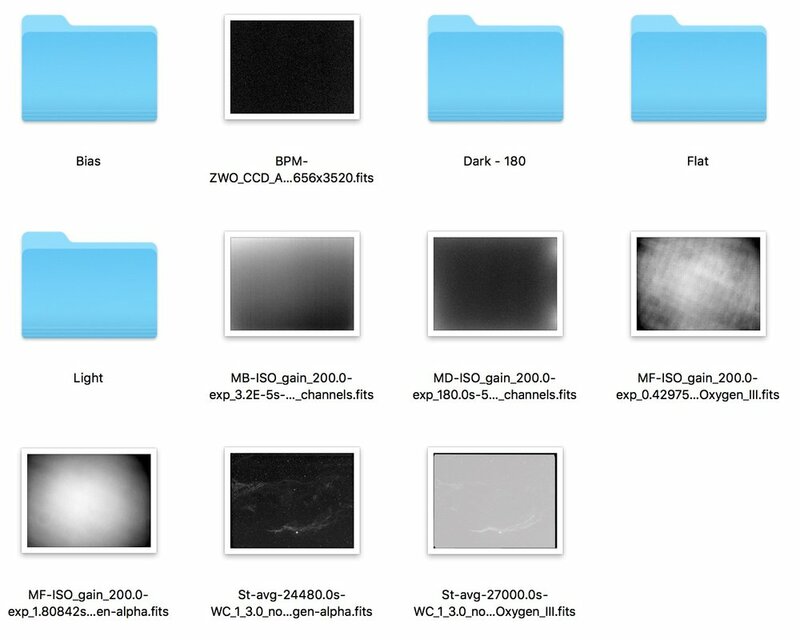 Thanks to the clean structure of EKOS when imaging, it organized all the data for me into proper folders. From here, I was able to load all of the data into Astro Pixel Processor at once, loading up each channel's info and specific calibration frames. From here I left it to process on it's own. It took about 2 hours total to go through all 500 images and calibrate them. After this point, I was left with two final calibrated frames, one for H-a, and one for OIII. I brought them into PixInsight to crop, and align, then stretch them to appropriate levels. I then used PixelMath inside PixInsight to combine the two monochrome images into a bi-color pallet showing the result above. Finally I moved the file into PhotoShop to enhance the color and contrast slightly, as I prefer the controls in Photoshop for this task. Below are some other pixel math combinations for how you could combine the two images into other color pallets. You can see all the equipment details over on my Astrobin page. 1,000% CPU utilization in Astro Pixel Processor. I'm three hours into processing this stack of 720 luminance images for M101. It's currently 29% in writing the light stacked image. So I anticipate about 4 hours total to stack this set. Interestingly CPU utilization isn't maxed. This iMac Pro has 32GB RAM, and 8 cores clocked at 3.2 GHz.